Did you know that drivers using the 100-mile radius exemption and time records instead of logs can cross state lines and still claim the exemption?. That is because the Federal Motor Carrier Safety Regulations apply to interstate commerce, so crossing the line does not affect the use of the 100-air-mile radius exemption. 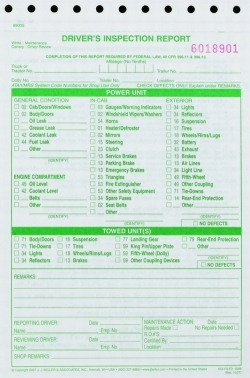 This Detailed Driver Vehicle Inspection Report 3-Ply Snap-out Carbonless Checklist Style A 3698/652-FS-F3 lists specific tractor and trailer parts to help simplify inspection... drivers simply check-off parts that need repair. 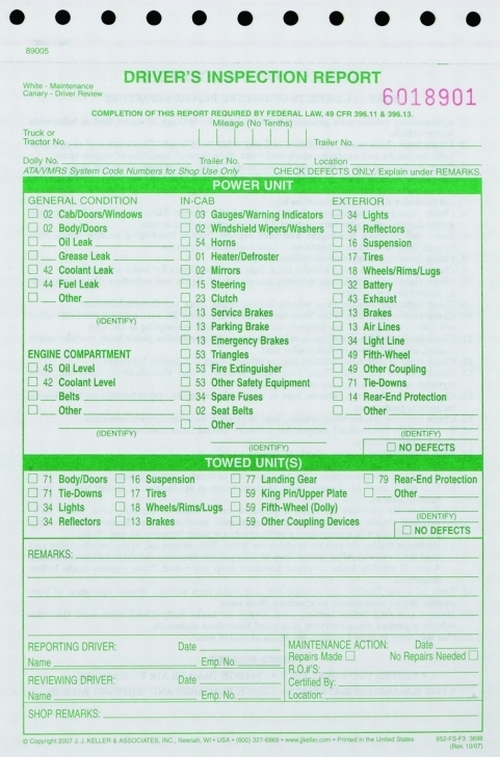 This detailed DVIR satisfies DOT Vehicle Inspection regulations 396.11 and 396.13. DriverLogBooks is a subsidiary of RoadTrucker, Inc.